Yes, it been released. As long as you can remember this emulator front end for C64 emus has been waiting in the wings, being re-polished and brushed up for release. Now after years, its finally here in its 2 CD set glory. To try to get it of the net is easy, its the games that Gamebase runs that is the hard part. Try using Kazza for the ISO files, as the servers the games are held on at present seem to be constantly hammered by would be Commodore gamers. Meeting up with producers John and James at Back in Time, we chatted into the night about Gamebase and it truly seems to good to be true. Loads of games to play complete with screenshots, gamemusic and even the .tap file on hand so you can load it as if from tape. Box shots and lots of information? Its all here and has it been worth the wait? Check out the full PnP review soon. 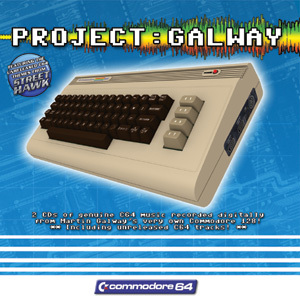 Have you heard the C64 Martin Galway tunes as they intended? It does not seem so as Boz has been working hard on a new 2 CD sets of Commodore 64 themes produced from Galway's source disks and played through the SID chip he worked on. Sounds like for a really c64 music fan only eh? Well, it sounds weird but the music is different (the SID chip differed from machine to machine ya see) but is it worth the dosh. What does Street hawk (unreleased) finally sound like ?Grab the review here soon.